It’s your dream job: Playing video games. Writing about them. Getting paid. It will never happen, right? Actually, it can. It’s definitely not easy to get this dream job—it requires a lot of perseverance, plenty of patience, a certain amount of skill, and a fair amount of luck. But with the right combination of elements, this job can be yours. 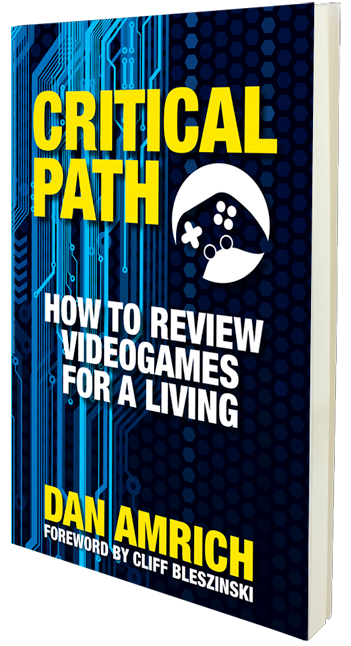 Critical Path: How to Review Videogames for a Living will tell you what you need to know and what you need to do to make a run at this career, for real. This includes how to write compelling reviews, how to pitch yourself as a writer, how to tackle some tricky ethical quandaries, and yes, even how to get free games. Based on Dan Amrich’s own experience as a game journalist for more than 15 years, it’s advice that can serve you for your entire career, from press start to game over. So, the next step is yours. Get Critical Path, and press start.